The present small church building, erected by Lord Craven in the 1770’s, replaced an earlier one which in the Middle Ages was known as St. Swithin’s. Mention of an ordained minister connected with Binley dates back to the late 16th century. A number of features in the building are a reminder of the historic links with the Craven family. Their coat of arms is in evidence above the sanctuary, and the Craven Chapel was once used almost exclusively by their family & household. The new Georgian building was dedicated to St. Bartholomew, one of the Lord’s twelve apostles. Little is known about him but many scholars equate him with Nathanael mentioned in John’s Gospel (see Matthew’s Gospel 10: 1-4; John 1:43-51; 21:2; Acts 1:13). Tradition has it that he was martyred, meeting his death by being flayed alive. 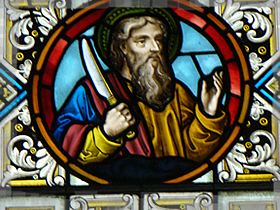 It is for this reason that the stained glass window in the north wall depicts him holding a butcher’s or flailing knife. The east window, the work of William Peckitt of York, depicts Mary and the infant Jesus. 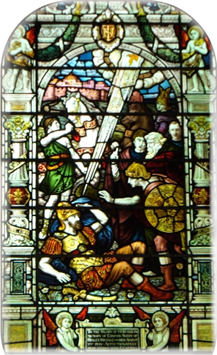 The stained glass window in the south wall portrays the conversion of Saul, known later as Paul, on the road to Damascus (see Acts 9).